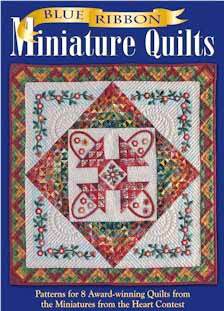 Eight award-winning miniature quilts from the �Miniatures From the Heart� contest are showcased in the full-color book, �Blue Ribbon Miniature Quilts. These quilts are visually stunning with balanced designs, attractive pieced and appliqu�d borders, and excellent color selection. They are also remarkable for their visual richness in such a small format: the largest is only 28� square! I was lucky enough to see some of these quilts in person and they are expertly photographed here to show the exquisite craftsmanship and detail of each one. Two of the quilts included are original pieced medallion style minis with appliqu� embellishment. The rest are variations of traditional block designs, including Log Cabin and Flying Geese, Bear�s Paw, Mariner�s Compass, and Burgoyne Surrounded. Each quilter shares her techniques for achieving precision on such a small scale. These projects are challenging to be sure, but rotary cutting measurements and full-size patterns for foundation piecing as well as some hand quilting designs are included, with �clear instructions and diagrams in full color to ensure accuracy�. This book is a visual treat and another great value from Chitra. Look for it at your favorite quilt shop.